To put it simply, title insurance is a way to protect yourself from financial loss and related legal expenses in the event there is a defect in title to your property that is covered by the policy. 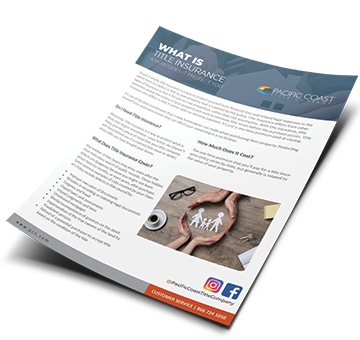 Title insurance differs from other types of insurance in that it focuses on risk prevention, rather than risk assumption. With title insurance, title examiners review the history of your property and seek to eliminate title issues before the purchase occurs. Title insurance also differs in that it comes with no monthly payment. It’s just a one-time premium paid at closing. It's one of the best investments that a new homeowner can make when purchasing their property. Protecting yourself from unforseen events that can affect your ownership is a no-brainer. Absolutely. Title insurance is a way to protect what is likely your largest investment—your home. An Owner’s Policy provides peace of mind that your title company will stand behind you if a covered title issue or defect arises after you have bought your home. The one-time premium that you’ll pay for a title insurance policy varies by state, but generally is related to the value of your property.